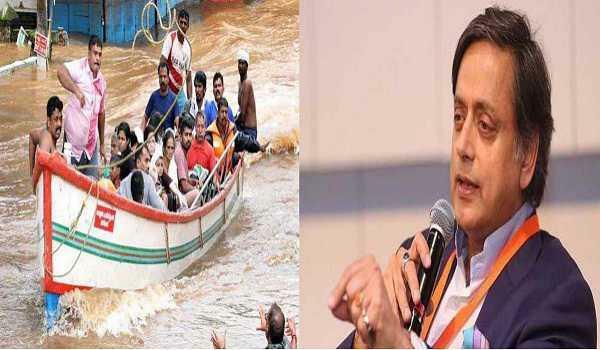 Thiruvananthapuram, Feb 7: Dr Shashi Tharoor, MP, has recommended Nobel Peace Prize to Kerala fishermen, whose deeds of courage were the main highlight of rescue operations during the floods in the state last year. "It was during the height of this tragedy that fishermen groups of Kerala, taking great risk to their lives and potential damage to the boats that are the source of their livelihood, jumped into the fray to save their fellow citizens," he wrote in his letter to the Chairperson of the Norwegian Nobel Committee. "They took their boats inland, and with their expert knowledge of the local conditions, their participation in the ongoing rescue and relief operations proved to be a game changer, as not only they able to pick up stranded personnel in their vicinity, but also instrumental in guiding boats of other rescue teams amidst the swirling waters." "Fishermen groups across the country represent some of the most socio-economically underdeveloped segments. Kerala's fishermen are no exception", the Congress Party Lok Sabha member from Thiruvananthapuram said. "Inspite of these conditions, as their life saving service during the floods clearly demonstrated, there is an extraordinarily altruistic spirit that animates and drives these coastal warriors of the state." "The lasting image of a fishermen bending low in the water so as to allow an older person he had rescued to climb on his back and get on his boat is a particularly striking reflection of this spirit that has been etched into the hearts of a grateful community," Mr Tharoor mentioned in his letter.